Using high-resolution ice core and tree ring proxies for sea ice extent (SIE), we reconstructed a robust time series of autumn SIE over the Barents-Kara (B-K) sector of the Arctic from AD1289–1993. After intercomparing the results and statistical parameters using the ordinary least squares regression (OLSR), the principle component regression (PCR) and the partial least squares regression (PLSR) methods, SIE time series were synthesized into a more robust series using the weighted average method, which used the explained variances as weights. The results showed that from the end of the 13th century to the end of 18th century, the autumn B-K SIE was large, with large variations and a slightly expanding trend overall. 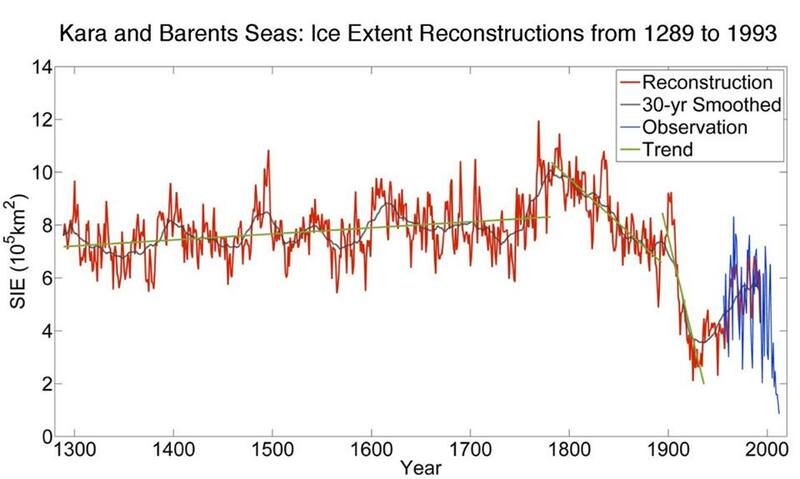 This reflected significant multidecadal oscillations under the Little Ice Age (LIA) background. The B-K SIE began to decrease at the end of the 18th century, and a shrinking trend became significant during the second half of the 19th century, which lasted into the 1930s–1940s. The 1930s–1940s was a period with a relatively low SIE in the B-K Sea, and the SIE had a short period of expansion from the 1940s–1970s. However, the B-K SIE has continuously and significantly shrank since the 1970s. The reduction in the B-K SIE since the end of the 18th century has been unprecedented in both duration and speed over the last 700 years. The B-K SIE has retreated significantly since the 1970s, with a speed 6.18 times greater than the former mean retreating speed. The industrial revolution may be a dominant factor in this result. The Arctic SIE in recent years may be the lowest it has been over the last millennium.